#2. He Has More Twitter Followers Than The Population Of Canada! That’s a lot of Twitter followers! Ey? The population of Canada is just 34.5 million people! 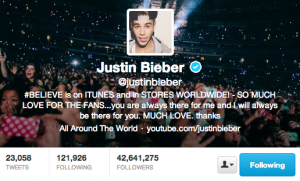 Justin Bieber’s Twitter count is almost ten million more!